CB Tech Under Sink Water Filter shown with included plastic stand. 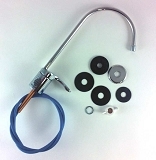 All necessary installation parts, tubing and Chrome Designer Faucet included. Carbon Block Technology, the makers of Multipure, presents the new CB Tech Authorized Dealer lineup of NSF/ANSI Certified Water Filters. Meets or exceeds Standards 42,53 and 401. This is the only water filter you will ever need to buy. Lifetime Stainless Steel housing warranty. Long-lasting easily replaced filter cartridges. Protect your families health with the penultimate water filter. Take a look at the NSF/ANSI Certified Tests. Always Rated #1 Water Filter in test after test. NSF/ANSI Certified. 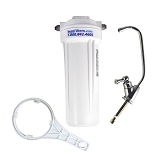 This filter cartridge uses the same NSF certified carbon block technology as the MP750SB with the CB6 cartridge and now available in a Commercial grade water filtration system, however the filter cartridges are not interchangeable. Bottled Water, it's expensive and ecologically damaging. San Francisco just banned disposable plastic water bottles! The Smart Answer: A CB Tech CB-VOC-SB Under Counter Drinking Water Filter System. Enjoy Fresh, Clean Drinking Water for 6-9¢ a Gallon with No Heavy Lifting! 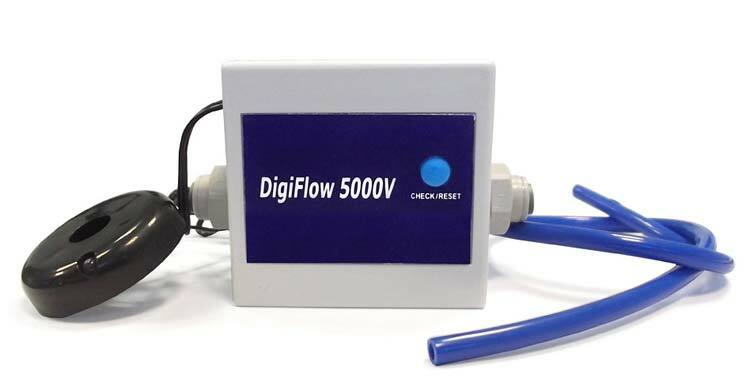 The Optional electronic capacity monitor that measures the amount of water processed through the drinking water system. An included light indicator installs at the base of the faucet, and lights up when the filter needs to be changed (both the monitor and light indicator are battery-powered; batteries need to be changed when the filter is changed). With the accuracy of the capacity monitor usage may be safely increased to 1200 gallons, versus the normal recommended annual replacement. And look for added Savings when you place your CB Tech Water Filter in your Shopping Cart. We'll also include a Stainless Steel Water Bottle with your water filter system purchase. 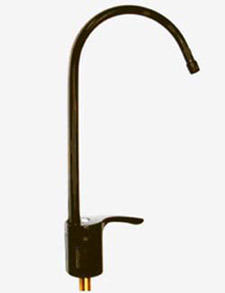 The CB Tech CB-VOC-SB is an extremely effective drinking water filtration system, for contaminant reduction that installs below your sink and provides convenient access to fresh, clean drinking water with a separate faucet at the sink. The CB-VOC-SB uses its own specially-designed drinking water faucet that is installed directly on your sink top, requiring little space. And the optional electronic capacity monitor safely allows 1200 gallons of usage. The water filtration unit can set on the cabinet floor with the included plastic stand or be mounted on the cabinet wall. It also may be connected to an icemaker using an icemaker tee fitting, and the system may be converted to a countertop unit with the purchase of a conversion kit (icemaker tee and countertop conversion kit not included). 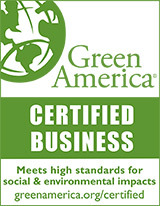 CB Tech Drinking Water Systems use a solid carbon block water filter cartridge that is considered to be the most effective method for reducing a wide range of contaminants of health concern that may be present in the water. The carbon is compacted into a dense structure, causing every molecule of water to be forced through microscopic pores of carbon, effectively reducing pollutants. 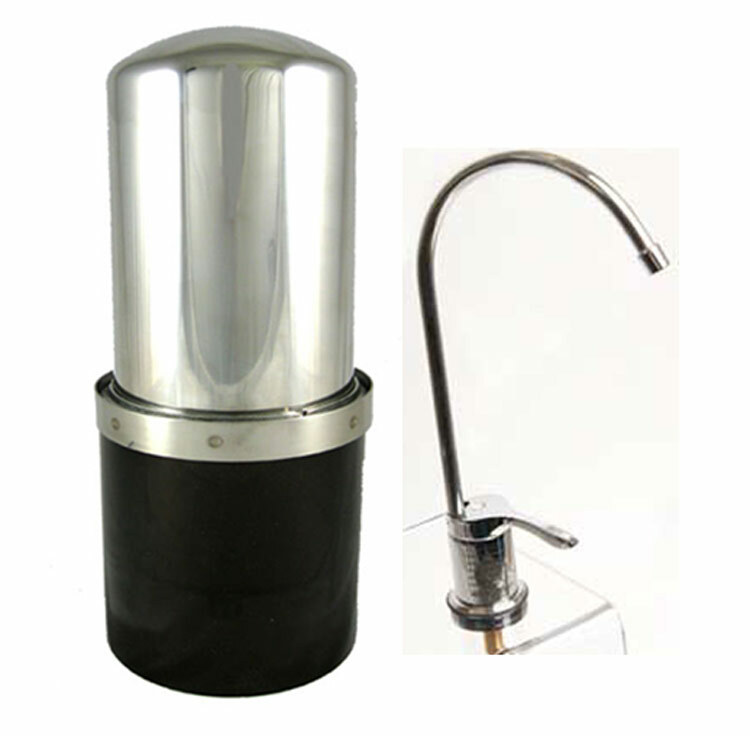 The solid carbon block water filter is a replaceable cartridge designed so that it may be easily changed. 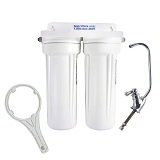 Additional advantages of the solid carbon block water filter are that it does not waste water, there is no electricity required, it does not remove essential trace minerals that are beneficial to good health, it does not add salt or silver to the water, and it provides fresh, delicious, healthy drinking water. The filter housing is constructed of durable stainless steel and the system is tested to meet stringent NSF/ANSI certification standards. With a Lifetime Warranty on the stainless steel housing, a CB Tech® Drinking Water System is easily the most cost-effective drinking water filter available for the money. We could not be happier with this filter and the faucet we ordered. A friend recommended this to us and we recommend this product to everyone. It's a great filter with delicious water. It's attractive with good flow. Worth the price. This is an excellent filter. The band is a little hard to remove to change filter but is a sure way to seal both half of the housing. The faucet is very easy to operate. I added a short (five inches) sediment pre-filter in front of the filter and hope to extend the filter life a little longer. It is surprising to see how dirty "city" water is; dirt, rust, etc. I mounted this and the pre-filter to a wooden platform under the sink and tap into the cold water supply line with a T-adapter. It is working very well. I tightened the plugs and there have been no leaks for two weeks. It was an easy enough install for an average working person with two young children to do over a few days with just a few tools. The water is fine, and the flow is acceptable. We have used a multipure countertop unit for years, but got new counter tops and went with the under sink model. FOr the price, they should give you much better quality connections. The plastic connections immediately leaked so I went out and retrofitted it with brass couplings. Ultimately, I'll replace it with refrigerator supply line hoses. Multipure should be ashamed of this set up. That said, the water flow is terrific, the water is delicious and the faucet looks great. I'd buy it again. A quality filter. The plumbers who installed it during our kitchen renovation commented on how good the system is. Read the manual though and make sure you run it for awhile and flush it out after its first installed. It takes quite awhile to get to a point where the water is clear. If you run it for several minutes the first couple of times you use it, it will flush it out and then be fine for normal use later. 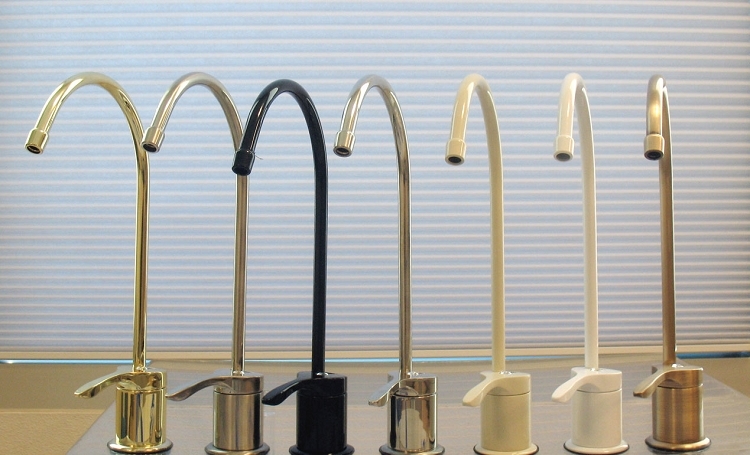 We couldn't be more pleased with the Multipure Undercounter Water Filter System. We replaced our famous name branded reverse osmosis system with this Multipure system. The old RO system was sending a lot of extra waste water down the drain. The Multipure system doesn't waste water like the RO system did. We actually prefer the taste of the water from the Multipure system as well. The installation was simple but I would recommend sending the output to a bucket or down the sink when you first flush water into the new filter as it does have a lot of the carbon black in the beginning. By running the filter output into a bucket I was able to flush the system without sending this water to my ice maker water line. Once flushed, just hook the filter to the spout and to your ice maker if you have one. Great Filter! Just as great as the last one!!! Easy to install. Love the new faucet design! Need to start taking them with me when I sell my homes! 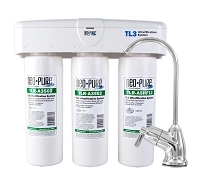 The Multipure Under Sink Water Filter System is certainly worth every penny! After we installed it, everyone exclaimed how wonderful the water tasted. You could really taste the difference!